"Locally grown" refers to food and other agricultural products (for example, wool or flowers) that are grown or produced, processed and then sold within a certain area. 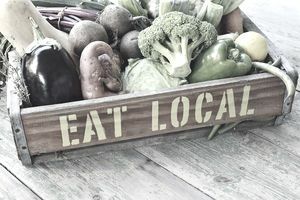 However, there's no standard definition of "local," and so businesses touting their "locally grown products" may be using very different definitions. Local isn't officially defined or monitored, so depending on whom you ask, local may be defined by the distance to market, staying within state or city borders, or by other regional boundaries. In densely-populated urban counties, "local" may mean within county lines. But in more rural areas where the population is sparse, and the distances between towns and cities are greater, "locally-sourced" produce and other items may come from a much wider area. Stricter locavores may argue that 100 miles from farm to table fits the definition of "local," and your favorite farmers' market may define "local" as even closer than that. Some large grocery store chains, meanwhile, may define "local" as "up to 450 miles away," and may use the term "regional" instead of "local." "Buying local" is growing in importance as many people begin to consider the impact of their own carbon footprint on the environment. According to the U.S. Department of Agriculture, local food markets' share of the grocery market is small but growing. It would be difficult to get more local than buying all your food and other agricultural products directly from the farms where they are produced, or from farms selling to consumers at local farmers' markets. In fact, smaller farms often find that a larger percentage of their business comes from local customers who buy from them directly, either on-site or at farmers' markets. Customers who buy directly from the farm or from nearby farmers' markets tend to value higher-quality food with a lower environmental impact and are willing to pay a premium price for it. They also place high importance on the nutritional value of the food they're buying, and on how the products they're purchasing are grown or raised. Sustainability often is key for this market. Locally grown food has a significant connection to organics. For one thing, many local farms are organic (some certified, some not certified). More important, though, is the raging debate about which is better: certified organic food or local food. While both local and organic foods carry pros and cons, people have some very strong opinions about which is best, and many would like to purchase both locally-produced and organically-grown food. People who buy locally grown produce also may feel strongly about other issues. For example, these customers may also want to see sustainable production and distribution business practices. Animal welfare issues and fair farm labor practices also are important to many customers who strive to "buy local." Finally, "the story behind the food" may be important to some customers, who like to meet growers and understand their ethics. For customers buying direct off the farm, it can help business for the farm itself and the surrounding landscape to look attractive. Martinez S et al. Local Food Systems: Concepts, Impacts, and Issues. U.S. Department of Agriculture. Executive Research Report No. 97. May 2010.